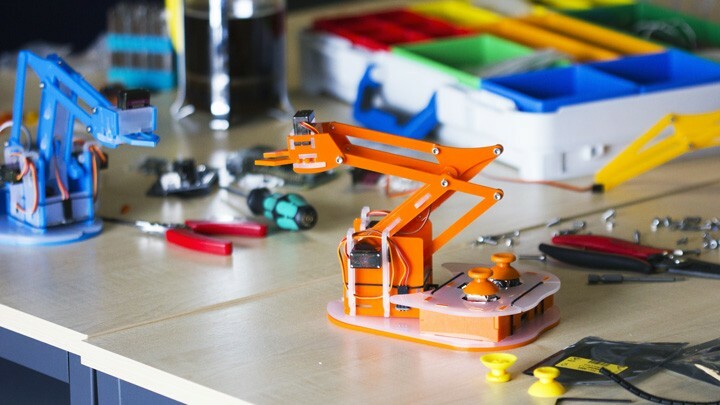 Mime Industries launched their latest product on Kickstarter; a Raspberry Pi powered robot arm kit that’s simple enough for kids to build. Ben Pirt from Mime Industries said “we believe in helping children to have fun whilst learning about technology and the MeArm Pi is completely designed around that goal”. Based on the original MeArm, which was launched on Kickstarter in 2014, this version has seen a complete re-working in order to make it much simpler for children to build. The kit integrates smoothly with the Raspberry Pi, the ubiquitous educational computing platform, using a HAT (a plug-on board that fits on the computer) with on-board joysticks for control. Because of the large ecosystem of programming language support for the Raspberry Pi it is also possible to program the movements of the arm using a wide range of popular programming languages. Mime Industries enables people to learn through play and exploration of technology. Their groundbreaking build-it-yourself kits have inspired children and adults to break through their own barriers and learn to build and code whilst having fun. Their products are simple to build and can be easily understood. Meaning you can use them to learn whilst playing, adding your own imagination to make something great. Dieser Eintrag wurde veröffentlicht in Crowdfunding, English, General und verschlagwortet mit Kickstarter, meArm, Mime Industries, Raspberry Pi, Robot-Arm von Sebastian Trella. Permanenter Link zum Eintrag.